Shiny Tapu Leo in game: 109 Who? Important notice! Pokemon Shiny Tapu Leo is a fictional character of humans. Tapu Koko (Japanese: ??·??? Kapu-Kokeko) is a dual-type Electric/Fairy Pokémon introduced in Generation VII. It is the guardian king of Melemele Island. Tapu Koko's head and torso are black with white markings on its chest, just above its eyes, and on top of its head. Extending from the top of its head is a large, orange plume with bristles along the back. There is a yellow marking covering the top bristle and half of the bristle below it. The bottom of this crest goes all the way to its neck, where it divides its face in half and creates a beak-like nose. It has small, blue eyes with yellow markings behind them. The lower half of its body is orange with four pointed projections: one short spine on the front and two short spines in the back, with one longer spine between them. These spines resemble a bird's tail feathers. Its thin arms have round, yellow structures encircling its shoulders. On each arm is a shell that appears to be half of a bird mask, and its hands end in two large claws to create a beak for the mask. The mask itself is mostly yellow with black, orange, and white markings. There are three white triangular markings with black edges on the top of each half of the mask, which create diamond-shapes when the mask is closed. The 'eyes' consist of a white diamond connected to a slightly larger orange diamond, which is inside a larger yellow diamond. Each of these shapes is edged in black. On each half of its beak is an orange triangle with a white rim. There are wing-shaped structures on each side, toward the back. 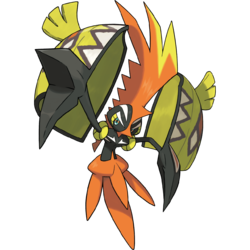 Tapu Koko is able to pull the mask together and hide its upper body inside, creating the impression of a stylized rooster. This Pokémon is called the guardian king of Melemele Island. It's known for protecting its home, but it is fickle and will not necessarily help people in need. However, it is very curious, and may come to play or battle with people or Pokémon that interest it. It is able to store electricity by closing itself inside the shells on its arms. It has an explosive temper, but it instantly forgets what enraged it in the first place. A Tapu Koko appeared in Alola to New Adventure!, in which it gave Ash a Z-Ring equipped with an Electrium Z. It reappeared in The Guardian's Challenge!, in which it challenged Ash and Pikachu to a battle. It taught them how to use the Z-Move Gigavolt Havoc and fled. 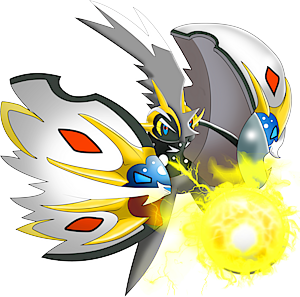 Tapu Koko first appeared in the Sun & Moon chapter, attacking Sun and Moon. After a short battle it escapes, leaving behind a Sparkling Stone. It is later mentioned during the Kahunas meeting about the recent sightings of the guardian kings. This guardian king of Melemele is brimming with curiosity. It summons thunderclouds and stores their lightning inside its body. Moves marked with a superscript game abbreviation can only be bred onto Tapu Koko in that game. 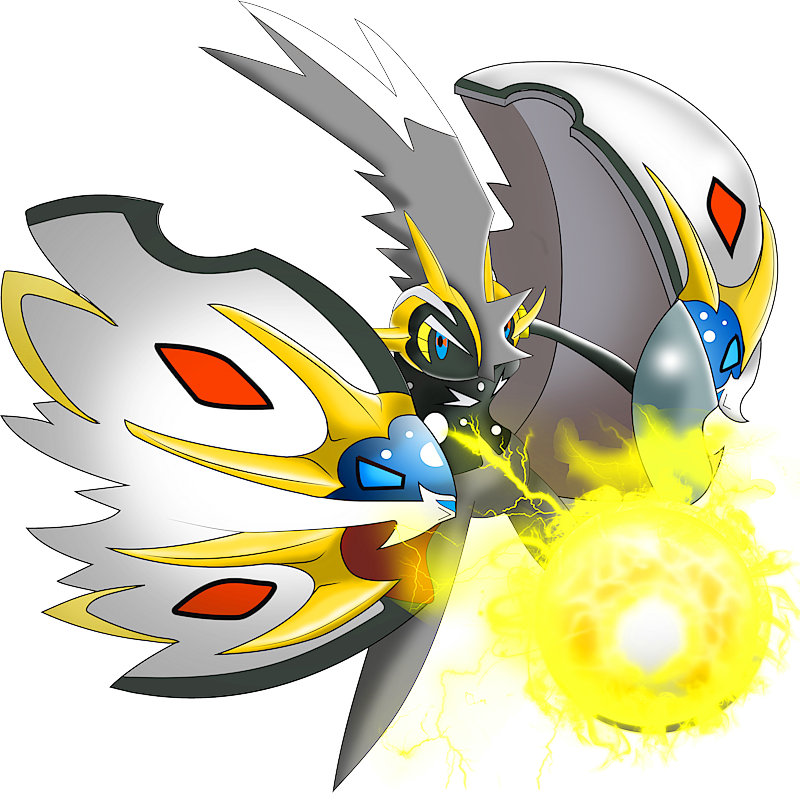 Tapu Koko has the highest base Speed stat of all Fairy-type Pokémon. Tapu Koko's mask appears to be a stylized rooster. Its design is similar to a totem pole. It may also be inspired by Kuka‘ilimoku, one of the four major Hawaiian kings and king of war and conflict, who is often represented as feathered. Tapu Koko may be a combination of tapu (Hawaiian for sacred or holy) and koko (Hawaiian onomatopoeia for a rooster's crowing). Kapu-Kokeko may be a combination of kapu (Hawaiian for sacred or holy) and ???? ?— kokekokko (Japanese onomatopoeia for a rooster's crowing).